Have you experienced a smaller fire in your home or business? Did it leave behind fire extinguisher residue? Have you experienced a smaller fire in your home or business? Late summer and early fall are ripe times for small fires due to fire pits, bonfires, cooking fires, or lighting up candles as night falls. But now that the fire has come and gone, and it’s been cleaned up, there’s another factor to consider. How exactly do you clean up the residue left behind by these fire extinguishers? Let’s find out. 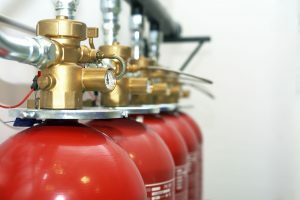 Dry chemical fire extinguishers use substances such as monoammonium phosphate, sodium bicarbonate, and potassium bicarbonate. The main problem is, all of these extinguisher chemicals leave a powder that can damage any surface it comes into contact with if left alone. If you have many metal surfaces in your home or business, you will want to clean up this residue as soon as possible. How do you do this? Use isopropyl alcohol mixed with warm water. This solution will take a few minutes to break down the residue. Then all you have to do is wipe down the affected area with a damp rag. If you are a commercial kitchen (or even in a residential kitchen) and residue has gathered on cooking tools and dishes, and your clothes, just use the dishwasher or the washing machine as you normally would. Wet chemical residue is left behind by wet chemical fire extinguishers suggested for use in commercial kitchens. First, turn off the power to all cooking surfaces. Next, put on some rubber gloves. Use a soapy sponge or a cloth to remove the remaining residue. Lastly, rinse away all traces of chemicals before you restore power to the cooking surfaces. If you have old fire extinguishers, how do you clean up that residue? Halon is the primary extinguishing substance in an old fire extinguisher. It won’t leave any visible residue, but the smell of smoke will linger. By diluting some degreaser, you can start cleaning up this residue. A sponge or spray bottle can help. Use a neutralized cleaning substance to remove the leftover residue. After that, wipe everything down and allow it all to dry. This entry was posted on Friday, September 15th, 2017 at 4:17 pm. Both comments and pings are currently closed.